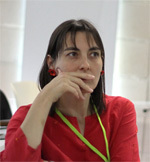 Sara Rovira-Esteva (1971- ) B.A. in Translation and Interpreting; Ph.D. in Translation Studies from the Universitat Autònoma de Barcelona. Her research interests include Translation Studies, Cross-cultural Pragmatics , Teaching Chinese as a Foreign Language and Contrastive Linguistics. She has authored four books and published numerous articles in journals on Chinese-Spanish/Catalan translation, Chinese linguistics and teaching Chinese as a foreign language. She has worked as a professional translator translating mainly Chinese films and contemporary Chinese literature.